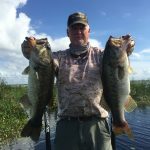 This week on Lake Okeechobee we have had a lot of rain and the lake is up over 15 ft. and the water temp is in the low 60’s. The water clarity on the East side of the lake is very muddy but the North end and the West end of the lake is pretty good. Sunday starts the 1st day of practice of the FLW Tour out of Clewiston, so the lake will be busy. The best bait is still shiners but on the artificial side Swim Jigs and Chatter baits have been catching some good fish on the outside of the grass line and I have seen some schooling activity on the west side of the lake this week. There also some flipping fish in the Cattails. The best baits for this technique has been a Black/Blue jig and a Senko fishing them slow. Good areas to fish are Kings Bar, Tin House, Indian Prairie and the Lakeport area of the lake.